The Index opened flat above 8000 but saw selling pressure to the lows around 7950 where buying interest was seen. The index went on to make a high at 8043 but late sell-off saw the index close weak at 7971.30, loss of 30.65 points. The broader market was also weak, with 668 advances to 837 declines. The broader range for the series stays at 7800-8500. 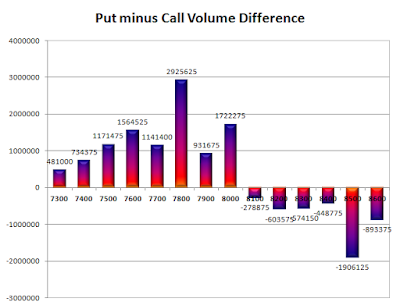 Call option 8000-8200, 8400-8600 added huge 13.86 lacs OI with small profit booking seen at 8300 strike price. 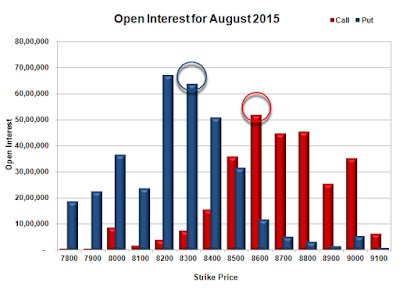 Put option 8000-7300 added huge 28.19 lacs OI with small short covering seen at 8100 and above strike prices. 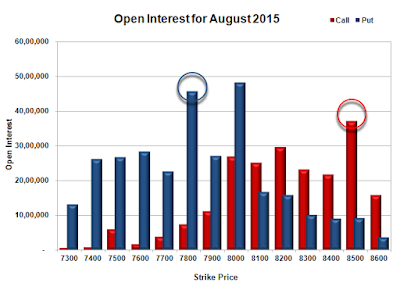 Nifty Open Interest is at 2,21,12,225 up by 1,25,850, with decrease in price, most probably short build-up. Bank Nifty Open Interest is at 19,41,750 down by 23,425, with decrease in price, most probably long liquidation. FII’s bought 5.57 lacs Futures, which includes 28778 contracts long build-up and 6503 contracts short build-up, with increase in net OI by 35281 contracts (includes 131652 longs to 109377 shorts for the day) and the Average Price comes to 7857.15. FII’s Index future open contract as on date is 651930 Longs to 264970 Shorts, Net Long 386960 up by 22275 contracts. Initial support stays at 8000, with OI of 48.16 lacs and below that at 7800 with OI of 45.77 lacs. Initial resistance at 8100, with OI of 25.14 lacs and above that at 8200 with OI of 29.59 lacs. 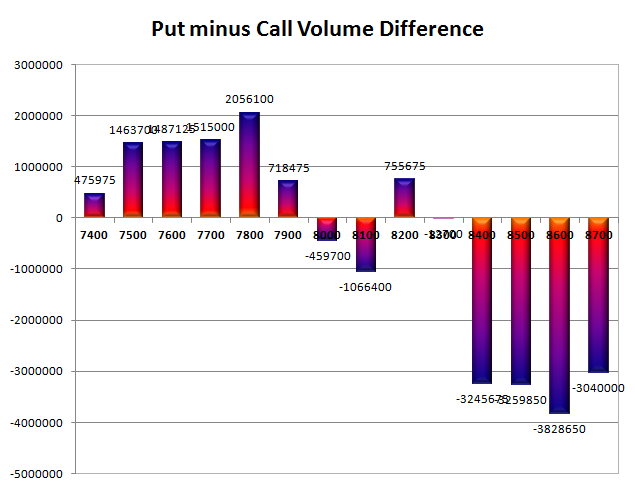 Day Range as per Option Table is 7867 - 8105 and as per VIX is 7869 - 8074 with 7988 as the Pivot. The Index opened strong above 8050 and went on to touch the highs of the day at 8092, but weekend profit booking saw the index dip below 8000, but closed just above at 8001.95, gain of 53.00 points. The broader market was flat, with 768 advances to 737 declines. The broader range for the series comes to 7800-8500. Call option 8000-8600 added huge 36.20 lacs OI with small short covering seen at 7800 and below strike prices. Put option 8100-7300 added huge 55.51 lacs OI with small short covering seen at 8200 and above strike prices. 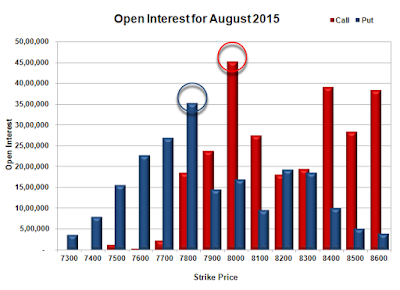 Nifty Open Interest is at 2,19,86,375 up by 9,40,650, with increase in price, most probably huge long build-up. 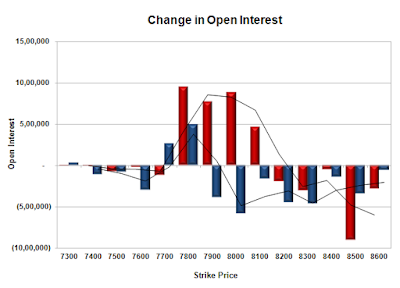 Bank Nifty Open Interest is at 19,65,175 up by 51,825, with decrease in price, most probably short build-up. FII’s bought HUGE 29.07 lacs Futures, which includes 104794 contracts long build-up and 11507 contracts short covering, with increase in net OI by 93287 contracts (includes 178820 longs to 62519 shorts for the day) and the Average Price comes to 7942.17. 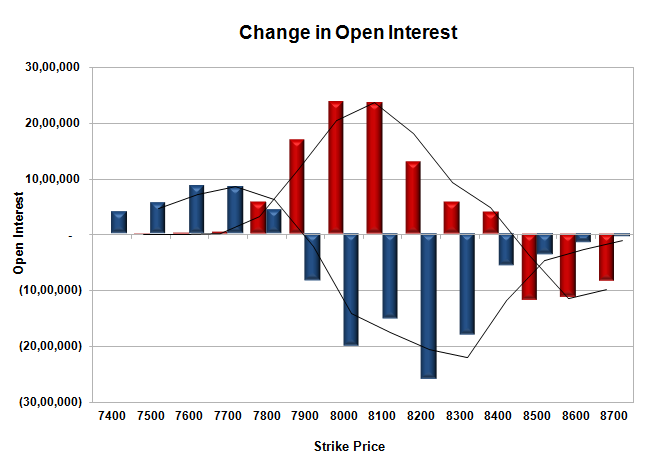 FII’s Index future open contract as on date is 623152 Longs to 258467 Shorts, Net Long 364685 up by 116301 contracts. 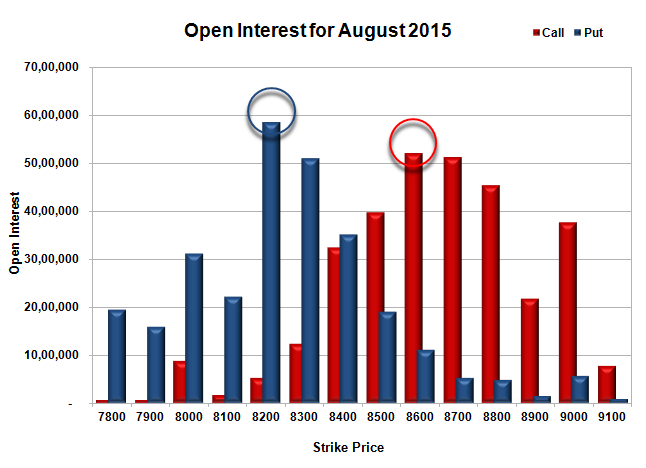 Initial support now at 8000, with OI of 43.30 lacs and below that at 7800 with OI of 43.71 lacs. Initial resistance at 8200, with OI of 27.79 lacs and above that at 8500 with OI of 34.34 lacs. 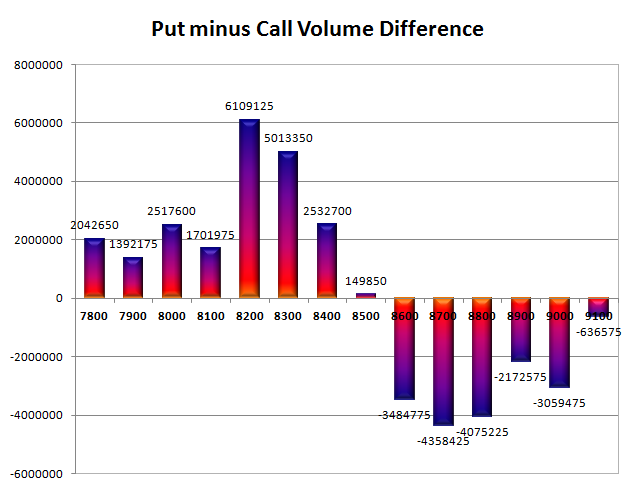 Day Range as per Option Table is 7889 - 8140 and as per VIX is 7904 - 8100 with 8018 as the Pivot. The Index for a change opened huge gap-up at 7921 and stayed mostly strong throughout the entire session of expiry day trade on the back of huge short covering to close near the highs at 7948.95, huge gain of 157.10 points. The broader market was also strong, with 1266 advances to 254 declines. 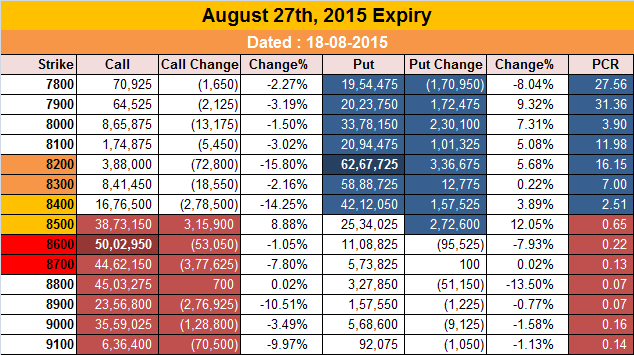 The broader range for September expiry comes to 7800-8500. Call option 7800-8500 added huge 40.69 lacs OI with profit booking seen at 8600 and above strike prices. Put option 8500-7300 added huge 44.34 lacs OI. 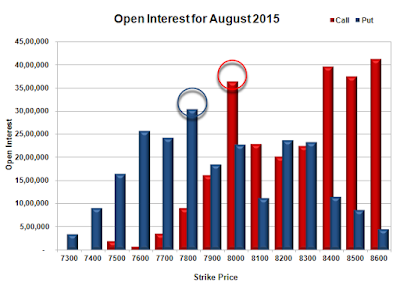 Nifty Open Interest is at 2,10,45,725 up by 43,38,200, with increase in price, most probably huge long build-up. 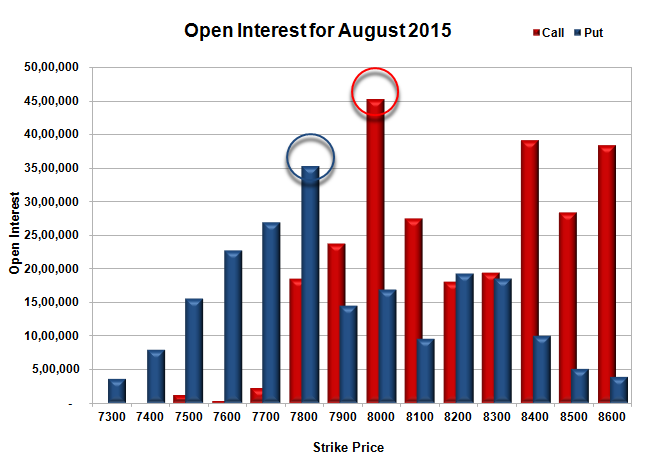 Bank Nifty Open Interest is at 19,13,350 up by 7,53,175, with increase in price, most probably huge long build-up. FII’s bought HUGE 19.21 lacs Futures, which includes 112148 contracts long liquidation and 283990 contracts short covering, with decrease in net OI by 396138 contracts (includes 327903 longs to 251066 shorts for the day) and the Average Price comes to 7930.89. 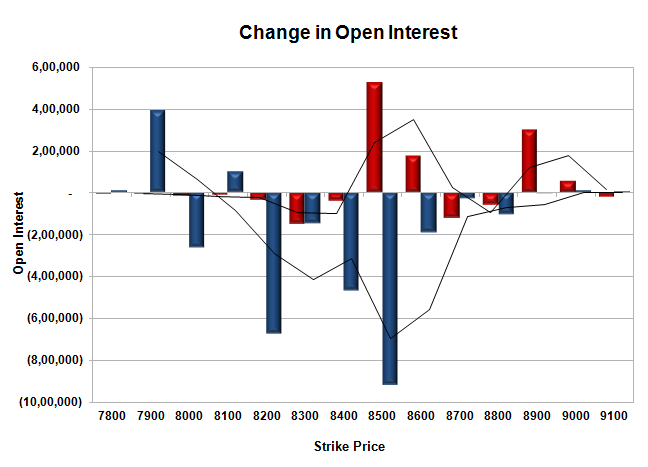 FII’s Index future open contract as on date is 518358 Longs to 269974 Shorts, Net Long 248384 up by 171842 contracts. 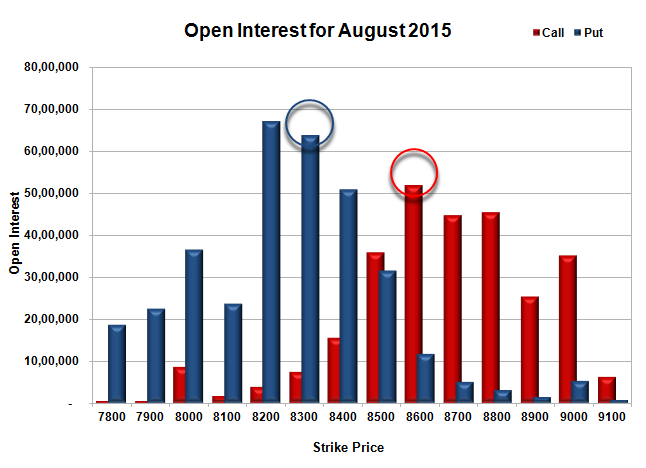 Initial support coming up at 7900, with OI of 20.46 lacs and below that at 7800 with OI of 36.44 lacs. Initial resistance at 8000, with OI of 20.39 lacs and above that at 8200 with OI of 22.44 lacs. 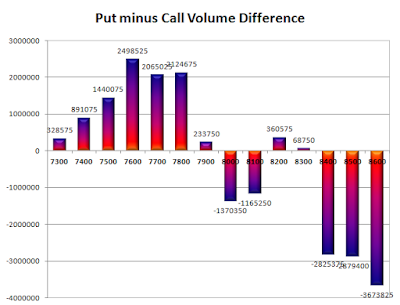 Day Range as per Option Table is 7802 - 8064 and as per VIX is 7857 - 8041 with 7925 as the Pivot. 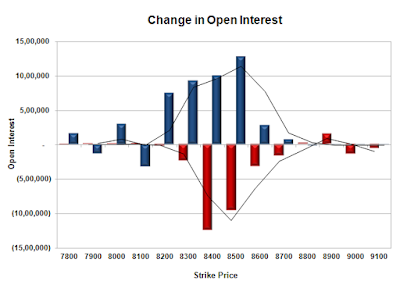 The Index opened negative but saw buying interest to the highs of the day around 7930, where the seller were waiting and sold big to the lows of the day below 7800 and closed at 7791.85, loss of 88.85 points. The broader market though was just positive, with 751 advances to 743 declines. The broader range for expiry comes to around 7700-8000. Call option 7800-8100 added huge 30.61 lacs OI with profit booking seen at 8200 and above strike prices. 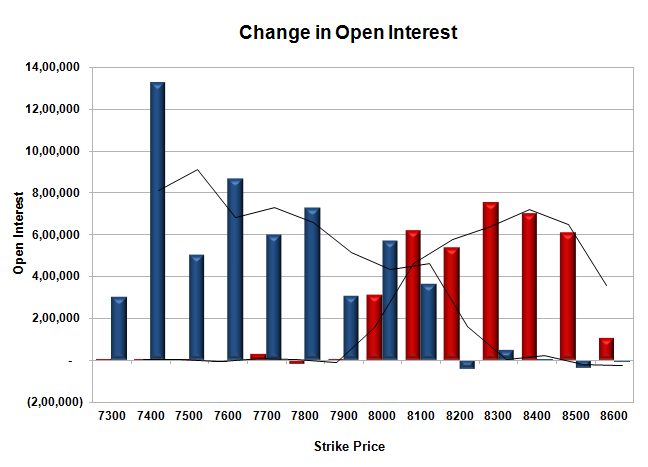 Put option 7800-7700 added 7.53 lacs OI with short covering seen at 7900 and above strike prices. Nifty Open Interest is at 1,14,95,075 down by 19,39,325, whereas Sept series added a whopping 43.81 lacs with decrease in price, most probably 100% roll-over with huge short build-up. Bank Nifty Open Interest is at 15,33,750 down by 2,47,700, whereas Sept series added 5.03 lacs with decrease in price, most probably 100% roll-over with huge short build-up. FII’s sold 0.86 lacs Futures, which includes 79507 contracts long build-up and 82954 contracts short build-up, with increase in net OI by 162461 contracts (includes 401138 longs to 404585 shorts for the day) and the Average Price comes to 7941.71. 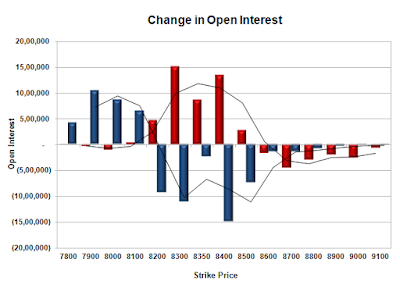 FII’s Index future open contract as on date is 630506 Longs to 553964 Shorts, Net Long 76542 down by 3447 contracts. 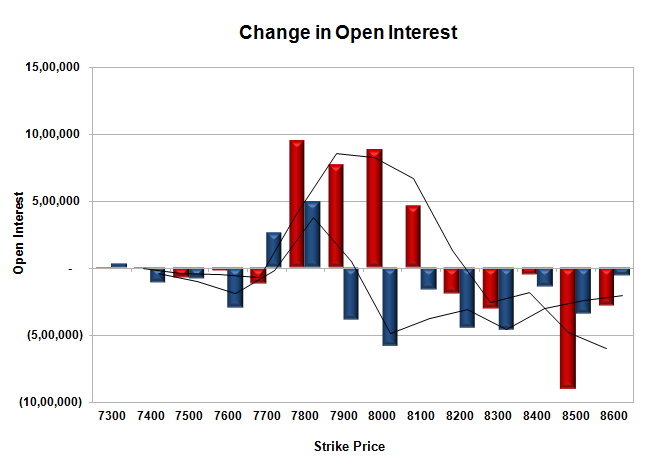 Initial and best support stays at 7800, with OI of 35.27 lacs and below that at 7700 with OI of just 26.86 lacs. 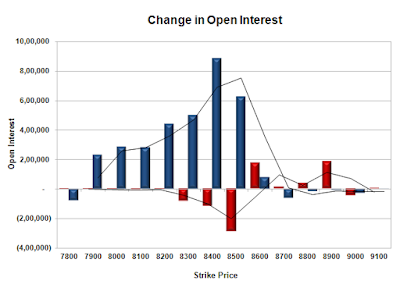 Initial resistance at 7900, with huge OI addition of 7.71 lacs and above that at 8000 with highest OI of 45.27 lacs. 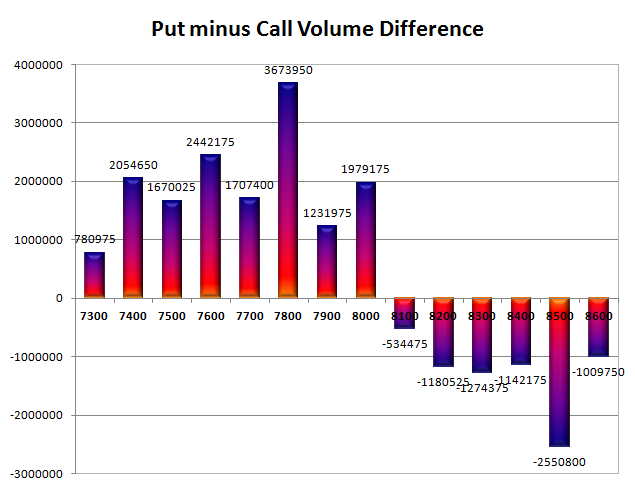 Day Range as per Option Table is 7693 - 7952 and as per VIX is 7688 - 7896 with 7833 as the Pivot. The Index opened positive around 7895 but dipped to new yearly low at 7667. Value buying saw the index close positive at 7880.70, gain of 71.70 points. The broader market was just negative, with 754 advances to 765 declines. The broader range for expiry comes to around 7700-8100. 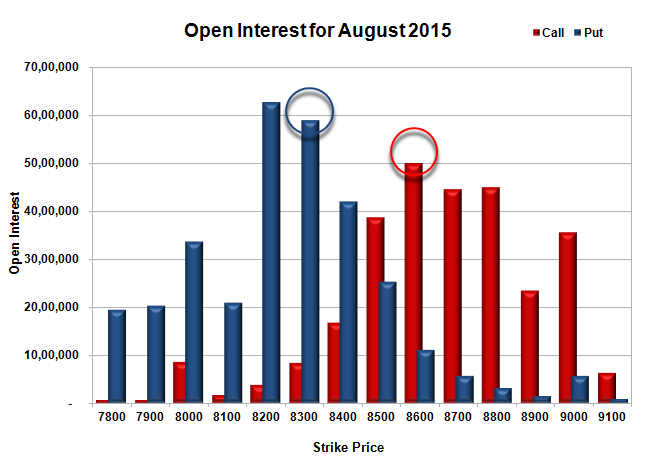 Call option 7700-7800, 8000 added huge 12.05 lacs OI with profit booking seen at 8100 and above strike prices. 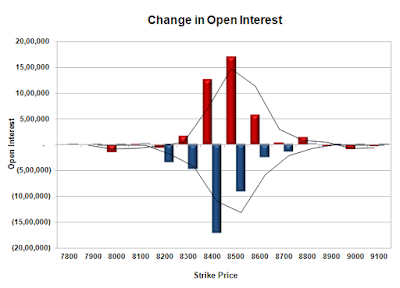 Put option 7800-7300 added huge 27.06 lacs OI with short covering seen at 7900 and above strike prices. Nifty Open Interest is at 1,34,34,400 down by 27,59,725, whereas Sept series added a whopping 44.27 lacs with increase in price, most probably 100% roll-over with huge long build-up. Bank Nifty Open Interest is at 17,81,450 down by 2,71,300, whereas Sept series added 0.36 lacs with increase in price, most probably small roll-over with huge short covering. FII’s bought 13.23 lacs Futures, which includes 94326 contracts long build-up and 41423 contracts short build-up, with increase in net OI by 135749 contracts (includes 417605 longs to 364702 shorts for the day) and the Average Price comes to 8050.50. FII’s Index future open contract as on date is 550999 Longs to 471010 Shorts, Net Long 79989 up by huge 52903 contracts. 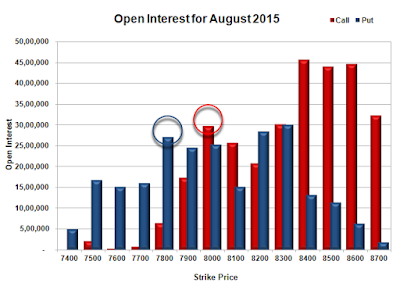 Initial and best support at 7800, with OI of 30.36 lacs and below that at 7700 with OI of just 24.24 lacs. 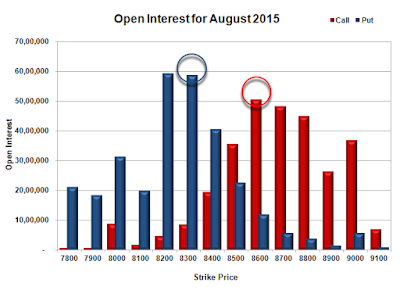 Initial resistance at 8000, with huge OI of 36.44 lacs and above that at 8100 with OI of 22.88 lacs. 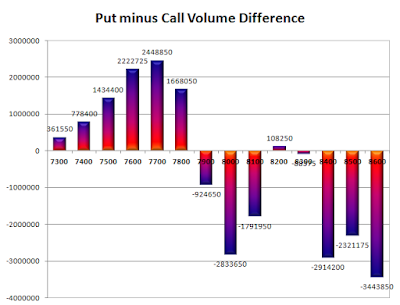 Day Range as per Option Table is 7707 - 7973 and as per VIX is 7770 - 7991 with 7824 as the Pivot. The Index opened gap-down around 8055 and saw the biggest fall of the last 6 years closing 7806.35, huge loss of 490.95 points. The broader market was very weak, with just 65 advances to 1508 declines. The broader range for expiry comes to around 7700-8100. Call option 7800-8400 added huge 92.91 lacs OI with profit booking seen at 8500 and above strike prices. 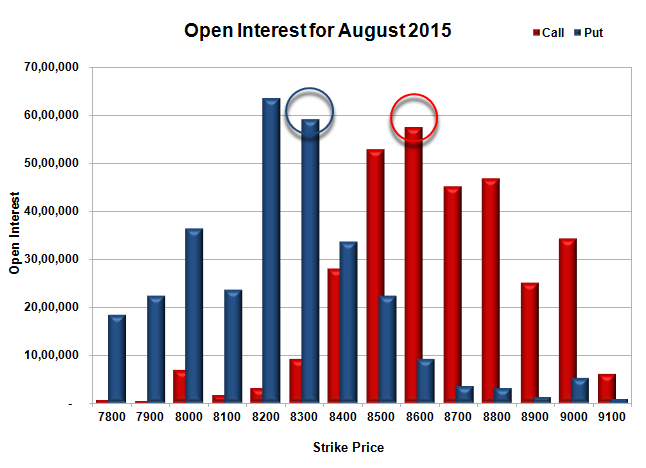 Put option 7800-7400 added huge 31.10 lacs OI with short covering seen at 7900 and above strike prices. Nifty Open Interest is at 1,61,94,125 up by 14,56,500, whereas Sept series added a whopping 49.10 lacs with decrease in price, most probably HUGE short build-up in both series. Bank Nifty Open Interest is at 20,52,750 down by 2,24,750, whereas Sept series added 1.90 lacs with decrease in price, most probably roll-over with huge long liquidation. FII’s sold 3.89 lacs Futures, which includes 129121 contracts long build-up and 144666 contracts short build-up, with increase in net OI by 273787 contracts (includes 417831 longs to 433376 shorts for the day) and the Average Price comes to 7983.27. FII’s Index future open contract as on date is 456673 Longs to 429587 Shorts, Net Long 27086 down by 15545 contracts. 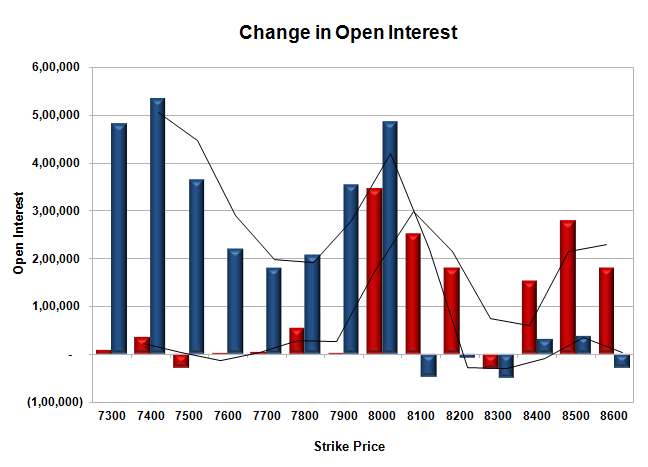 Initial and best support now at 7800, with OI of 27.06 lacs and below that at 7700 with OI of just 15.96 lacs. 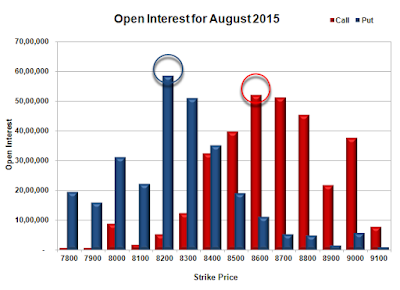 Initial resistance at 7900, with huge OI addition of 17.00 lacs and above that at 8000 with OI of 29.80 lacs. Day Range as per Option Table is 7738 - 7985 and as per VIX is 7694 - 7924 with 7879 as the Pivot. The Index opened negative around 8305 and went on to the lows of the day around 8225. A small pullback saw the index reclaim 8300 but closed just below at 8299.95, huge loss of 72.80 points. The broader market was weak, with 472 advances to 1046 declines. The broader range stays at 8200-8600. 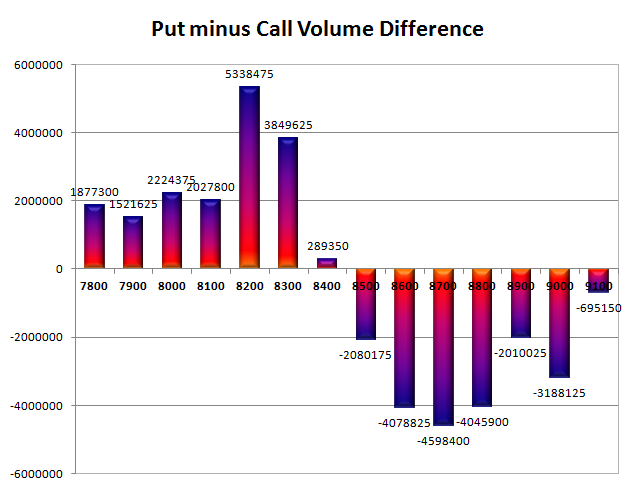 Call option 8200-8500 added huge 44.73 lacs OI with profit booking seen at 8600 and above strike prices. Put option 8100-7800 added huge 29.73 lacs OI with short covering seen at 8300 and above strike prices. Nifty Open Interest is at 1,47,37,625 up by 79,550, whereas Sept series added 8.92 lacs with decrease in price, most probably short build-up in both series. Bank Nifty Open Interest is at 22,77,500 up by 56,500, whereas Sept series added 1.66 lacs with decrease in price, most probably huge short build-up in both series. FII’s sold huge 26.12 lacs Futures, which includes 33923 contracts long liquidation and 70571 contracts short build-up, with increase in net OI by 36648 contracts (includes 134404 longs to 238898 shorts for the day) and the Average Price comes to 8800.68. FII’s Index future open contract as on date is 327552 Longs to 284921 Shorts, Net Long 42631 down by huge 10449 contracts. Initial and best support at 8200, with OI of 54.25 lacs and below that at 8100 with OI of 30.20 lacs. Initial resistance at 8400, with OI of 41.57 lacs and above that at 8500 with OI of 55.67 lacs. Day Range as per Option Table is 8206 - 8374 and as per VIX is 8226 - 8374 with 8282 as the Pivot. The Index opened negative but went on to touch the highs around 8500 where the sellers took control to move the index below 8400 with ease and closed at 8372.75, huge loss of 122.40 points. The broader market was weak, with 302 advances to 1226 declines. The broader range has contracted to 8200-8600. 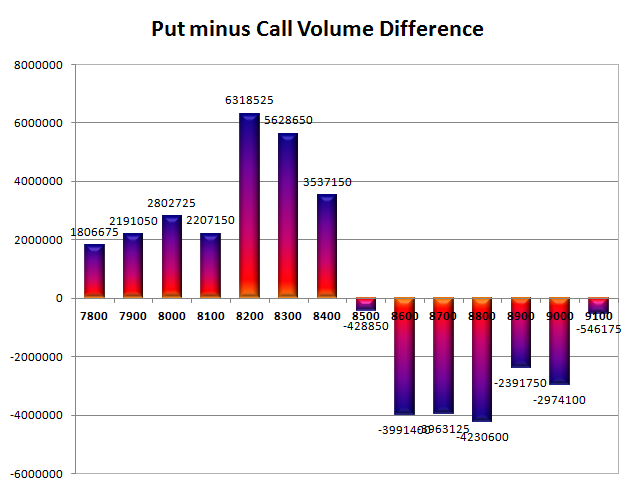 Call option 8300-8800 added huge 38.84 lacs OI with profit booking seen at 8900 and above strike prices. 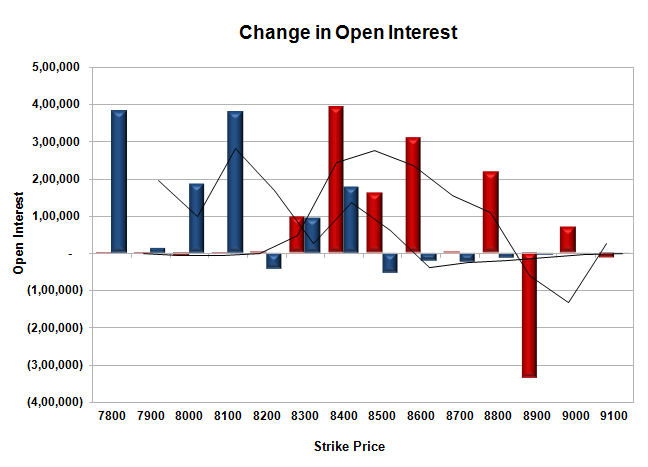 No Put option added any OI whereas short covering was seen at 8400 and above strike prices. Nifty Open Interest is at 1,46,58,075 up by 2,43,200, whereas Sept series added 2.69 lacs with decrease in price, most probably short build-up in both series. Bank Nifty Open Interest is at 20,98,600 up by 4,94,700, whereas Sept series added 0.77 lacs with decrease in price, most probably huge short build-up in both series. FII’s sold huge 21.19 lacs Futures, which includes 55166 contracts long liquidation and 29592 contracts short build-up, with decrease in net OI by 25574 contracts (includes 76495 longs to 161253 shorts for the day) and the Average Price comes to 8823.31. FII’s Index future open contract as on date is 361475 Longs to 214350 Shorts, Net Long 147125 down by 84758 contracts. Initial and very good support at 8300, with OI of 59.05 lacs and below that at 8200 with highest OI of 63.57 lacs. Initial resistance now at 8400, with huge OI addition of 12.53 lacs and above that at 8500 with OI of 52.85 lacs. Day Range as per Option Table is 8323 - 8479 and as per VIX is 8298 - 8447 with 8411 as the Pivot. The Index opened flat but dipped towards the lows of the day at 8426 within the first few minutes of trade only to see the responsive buyers took control from thereon to move the index back above 8500 but closed just lower at 8495.15, gain of 28.60 points. The broader market though was negative, with 743 advances to 758 declines. The broader range expanded to 8200-8800. 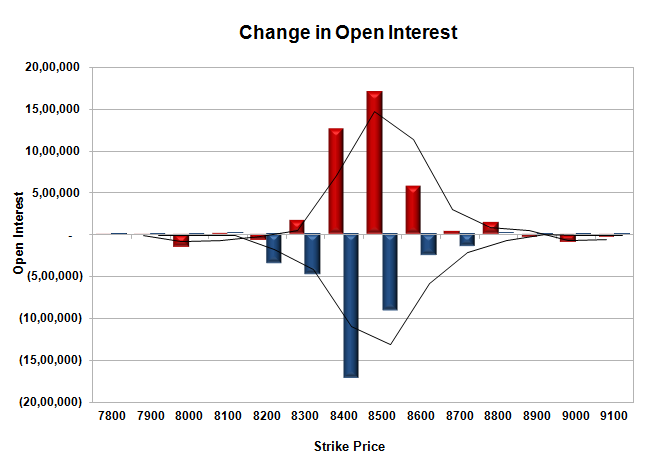 Call option 8600-8900 added 4.12 lacs OI with short covering seen at 8500 and below strike prices. Put option 8600-7900 added huge 33.15 lacs OI with profit booking seen at 7800 and below strike prices. Nifty Open Interest is at 1,44,14,875 up by 1,60,950, with increase in price, most probably long build-up. 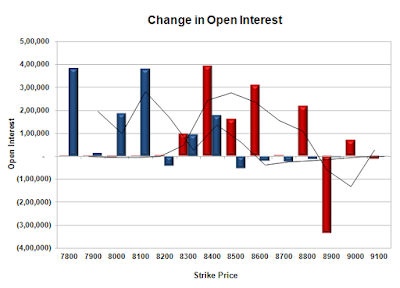 Bank Nifty Open Interest is at 19,51,675 down by 48,075, with decrease in price, most probably long liquidation. FII’s sold 4.62 lacs Futures, which includes 4941 contracts long liquidation and 13520 contracts short build-up, with increase in net OI by 8579 contracts (includes 47534 longs to 65995 shorts for the day) and the Average Price comes to 8953.44. FII’s Index future open contract as on date is 416641 Longs to 184758 Shorts, Net Long 231883 down by 18461 contracts. Initial super support at 8400, with OI of 50.96 lacs and below that at 8300 with huge OI of 63.86 lacs. 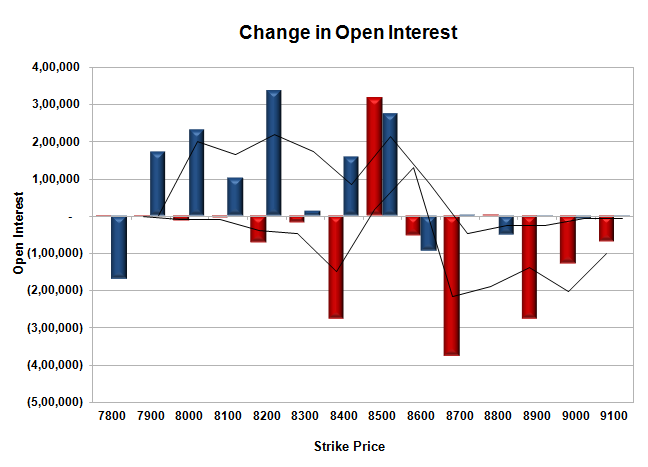 Initial resistance now at 8600, with OI of 51.78 lacs and above that at 8700 with OI of 44.76 lacs. Day Range as per Option Table is 8411 - 8559 and as per VIX is 8421 - 8569 with 8481 as the Pivot. The Index opened positive above 8500 and went on to make the high of the day within the first few minutes of trade but saw huge un-winding to the lows at 8434 but closed a bit higher at 8466.55, loss of 10.75 points. The broader market though was positive, with 884 advances to 631 declines. The broader range expanded to 8200-8800. 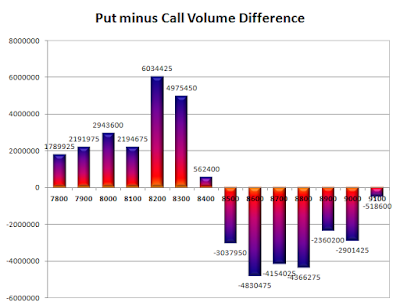 Call option 8500 added 3.16 lacs OI with profit booking seen at 8900 and above strike prices. 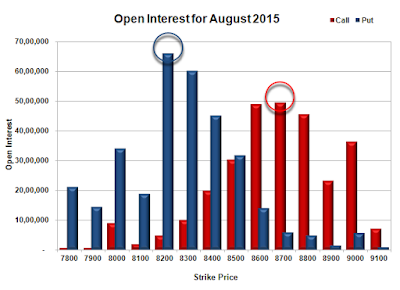 Put option 8500-7900 added huge 12.83 lacs OI with short covering seen at 8600 and above strike prices. 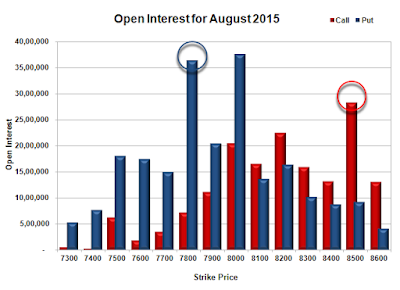 Nifty Open Interest is at 1,42,53,925 down by 2,41,800, with decrease in price, most probably huge long liquidation. Bank Nifty Open Interest is at 19,99,750 down by 1,01,050, with decrease in price, most probably huge long liquidation. FII’s bought 0.53 lacs Futures, which includes 2644 contracts long liquidation and 4747 contracts short covering, with decrease in net OI by 7391 contracts (includes 54674 longs to 52571 shorts for the day) and the Average Price comes to 9020.92. 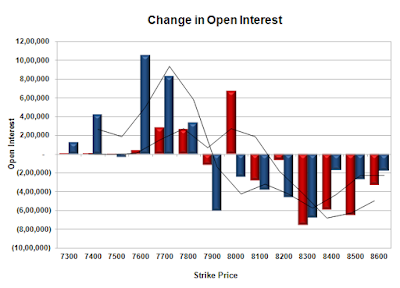 FII’s Index future open contract as on date is 421582 Longs to 171238 Shorts, Net Long 250344 up by 2103 contracts. Initial support still at 8400, with OI of 42.12 lacs and below that at 8300 with huge OI of 58.89 lacs. 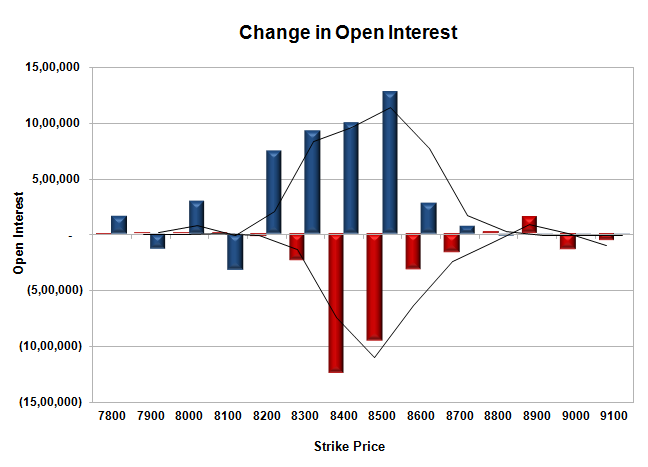 Initial resistance stays at 8500, with OI of 38.73 lacs and above that at 8600 with OI of 50.03 lacs. 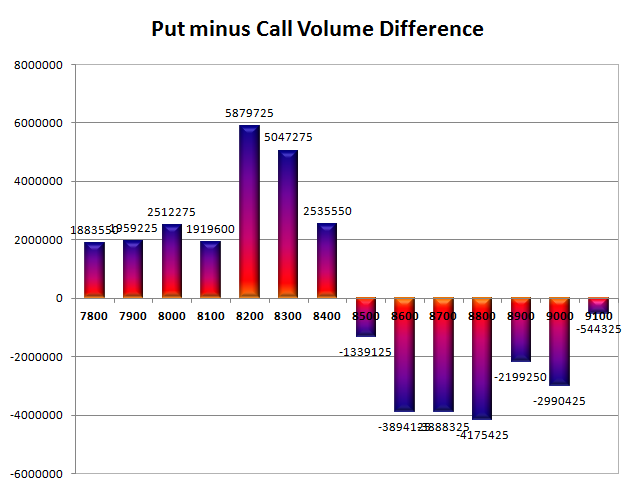 Day Range as per Option Table is 8399 - 8548 and as per VIX is 8394 - 8539 with 8475 as the Pivot. The Index opened flat to positive but saw huge un-winding within the first few minutes of trade to the lows of the day at 8428. Though the index saw some buying interest but closed weak at 8477.30, loss of 41.25 points. The broader market though was positive, with 772 advances to 750 declines. The broader range is still at 8300-8700. Call option 8500-8600, 8900 added 9.98 lacs OI with profit booking seen at 8700 and above strike prices. Put option 8100, 7900 added huge 4.91 lacs OI with huge short covering seen at 8500 and above strike prices. Nifty Open Interest is at 1,44,95,725 down by 5,60,325, with decrease in price, most probably huge long liquidation. 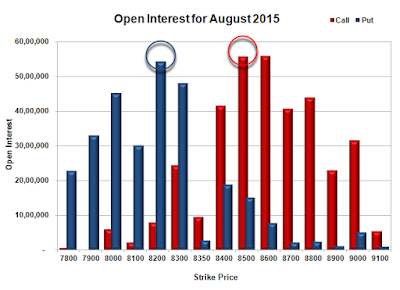 Bank Nifty Open Interest is at 21,00,800 down by 48,775, with increase in price, most probably short covering. FII’s sold huge 9.24 lacs Futures, which includes 29029 contracts long liquidation and 7945 contracts short build-up, with decrease in net OI by 21084 contracts (includes 47149 longs to 84123 shorts for the day) and the Average Price comes to 9060.16. FII’s Index future open contract as on date is 424226 Longs to 175985 Shorts, Net Long 248241 down by 36974 contracts. 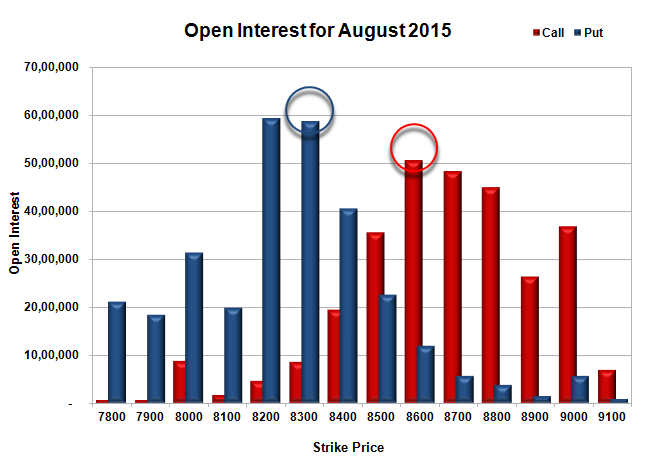 Initial support now at 8400, with OI of 40.55 lacs and below that at 8300 with huge OI of 58.76 lacs. Initial resistance at 8500, with OI of 35.57 lacs and above that at 8600 with OI of 50.56 lacs. Day Range as per Option Table is 8402 - 8555 and as per VIX is 8404 - 8550 with 8479 as the Pivot. The Index opened strong above 8400 and stayed strong throughout the entire session of trade making higher highs with each passing hour to close near the top at 8518.55, huge gain of 162.70 points. The broader market was strong, with 1082 advances to 420 declines. The broader range is now at 8300-8700. 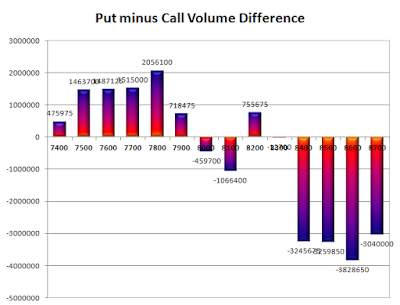 Call option 8800-8900 added 1.78 lacs OI with huge short covering seen at 8500 and below strike prices. Put option 8600-8200 added huge 42.29 lacs OI with profit booking seen at 8100 and 7900 strike prices. 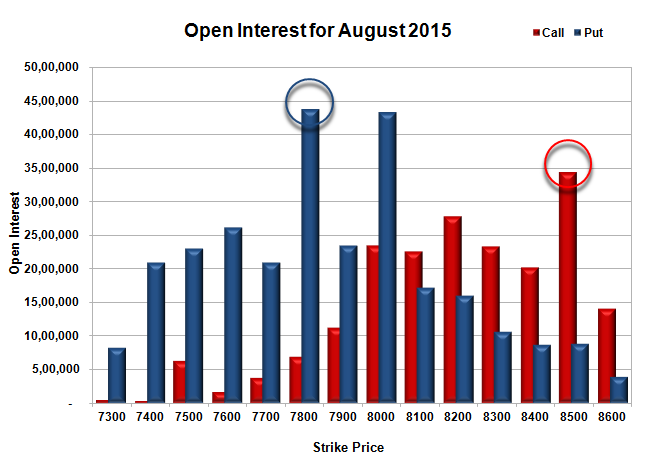 Nifty Open Interest is at 1,50,56,050 down by 6,35,600, with increase in price, most probably huge short covering. 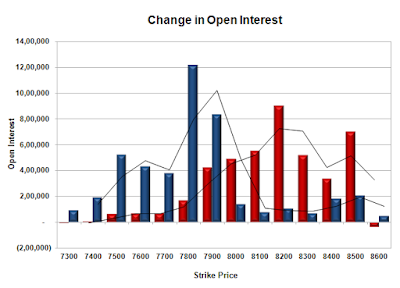 Bank Nifty Open Interest is at 21,49,575 down by 1,00,025, with increase in price, most probably huge short covering. FII’s bought 2.19 lacs Futures, which includes 4745 contracts long liquidation and 13489 contracts short covering, with decrease in net OI by 18234 contracts (includes 87905 longs to 79161 shorts for the day) and the Average Price comes to 9071.74. FII’s Index future open contract as on date is 453255 Longs to 168040 Shorts, Net Long 285215 up by 8744 contracts. Initial support now at 8500, with huge OI addition of 12.78 lacs and below that at 8400 with OI of 45.27 lacs. 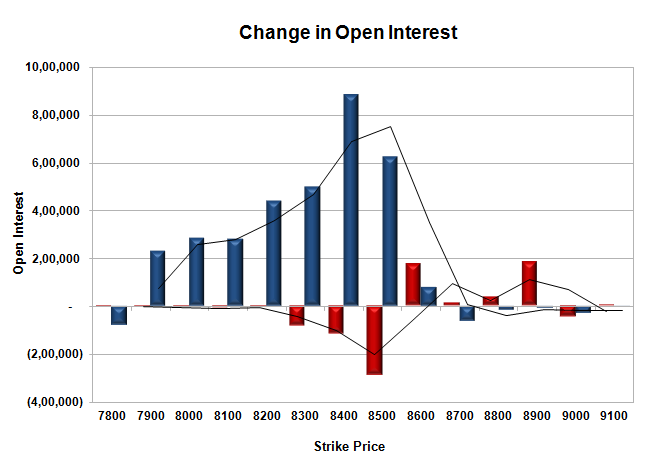 Initial resistance at 8600, with OI of 48.83 lacs and above that at 8700 with OI of 49.63 lacs. 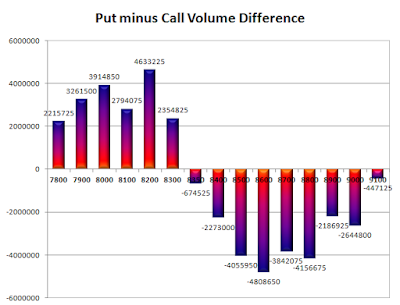 Day Range as per Option Table is 8411 - 8565 and as per VIX is 8447 - 8590 with 8477 as the Pivot. The Index opened strong and went on to scale 8400 within the first few minutes of trade only to see the seller back to move the index to the lows of the day and close just positive at 8355.85, small gain of 6.40 points. The broader market was weak, with 450 advances to 1059 declines. The broader range stays at 8200-8700. Call option 8300-8800 added huge 11.77 lacs OI with profit booking seen at 8900 and above strike prices. Put option 8400-7800 added huge 11.88 lacs OI with short covering seen at 8500 and above strike prices. Nifty Open Interest is at 1,56,91,650 down by 3,29,150, with small increase in price, most probably short covering. 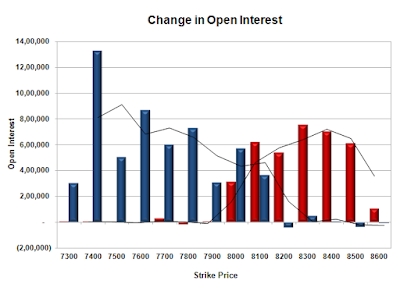 Bank Nifty Open Interest is at 22,49,600 down by 1,69,775, with increase in price, most probably huge short covering. FII’s sold 2.48 lacs Futures, which includes 6855 contracts long liquidation and 3062 contracts short build-up, with decrease in net OI by 3793 contracts (includes 36093 longs to 46010 shorts for the day) and the Average Price comes to 8738.60. 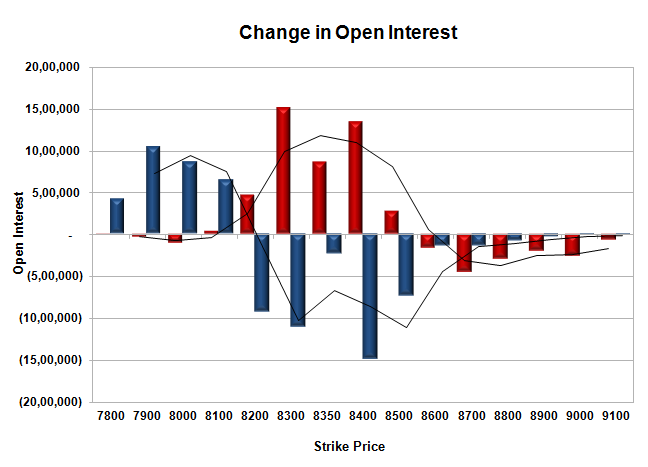 FII’s Index future open contract as on date is 458000 Longs to 181529 Shorts, Net Long 276471 down by 9917 contracts. Initial good support at 8300, with OI of 50.97 lacs and below that at 8300 with highest OI of 58.63 lacs. Initial resistance stays at 8400, with OI of 32.36 lacs and above that at 8500 with OI of 39.85 lacs. Day Range as per Option Table is 8303 - 8441 and as per VIX is 8281 - 8430 with 8375 as the Pivot.